About a week ago, I was walking down the hall in the UMD School of Music, on my way to the mail room, and the Opera Studio Coordinator, Laura Lee, stopped me and said "Are you coming Thursday?" "Coming to What," I said. "Holiday Spectacular!" I came to find out she has been stage-managing the Baltimore Symphony's Holiday Spectacular show for several years now. A sneak peak at the final dress rehearsal? Can't really pass that up. This past Thursday, I beat my way up I-95 in rush hour traffic, and it was well worth it. The host, this year, Ann Hampton Calloway, of broadway fame, has a fierce set of pipes, and opera star, Daniel Okulitch, duos and solos with the deepest bass-baritone voice I've ever heard. And I'm going to let out a secret about those Dancing Santas (which, by the way, are really something to see): they are high school students from the Baltimore School for the Arts! I know the BSO musicians might find the music a bit tedious; the level of music does not rank up there with Mozart, Strauss, and other classical greats. I've even heard some of them say it's all a bit chintzy- but you know, chintzy is as chintzy does. And, in this case, they do chintzy well! There are four shows left: two on Tuesday and two on Wednesday, to accommodate the wee folk. Check it out Here. Friday the 11th, I performed the Sibelius Violin Concerto with my son Stephen conducting his student orchestra at Yale in New Haven, Connecticut. The program began with Stephen conducting a commissioned piece by a Yale composer, then the orchestra played the first movement of Schubert's "Unfinished" Symphony, conducted by the Berkeley College Orchestra's assistant conductor. Thankfully we had about 25 minutes shortly before the concert to rehearse the entire second movement, and spots in the first and third movements. That was valuable because it was our first time together in the Battell Chapel, the site of the concert. The acoustics there were quite different than they were for our rehearsal the previous Sunday. There was warmth and reverberation in the chapel, both great qualities for making music. However, reverberation often makes it more challenging for a performance with a soloist, because the orchestra can easily be too loud for the soloist, especially a violinist. So I spent some of the rehearsal tying to play as loudly as I possibly could. That isn't usually the best strategy for making music, or even for getting the most sound out of a violin! So getting ready for the concert, I made some mental adjustments, planning to play just a little faster in the slow movement, for example, in order to sustain my tone more easily. And I tried to ignore the thought that I might be drowned out in this very symphonic concerto. I knew that if I played well, the way I had been practicing, I would be heard at least most of the time. Playing one of my very favorite pieces with Stephen conducting was truly magical! He controlled the orchestra very well, both in terms of tempo and volume. I was just a little nervous and tight for the first part of the first movement, but gradually I felt more comfortable and I started letting go. All the practice since early August really paid off, my memory didn't fail me, and my pitch was generally good (though there are a few notes I wish I could have back). Before we knew it, the 35 minute piece was over, and we faced the applauding audience, many of whom were standing. What a moment! I am blessed to have had such a great opportunity with my son. The members of the orchestra were very appreciative of my coming to play with them. I thanked them for such a great opportunity. My other son Eric came up from New York to see the concert, and of course my wife Jeanne was there. My parents made the trip from Virginia, my brother and his partner came from Boston, and my cousin from Rhode Island even came! So afterwards we all went out and celebrated. Then another blessing over the weekend: two whole days without touching the violin! Last Sunday afternoon I rehearsed the Sibelius Violin Concerto with the Berkeley College Orchestra of Yale University. My 21 year old son Stephen conducted. It was a wonderful experience for me!!!! The orchestra members were good musicians and very supportive. The Sibelius is a complicated piece to put together, especially if many of the musicians are playing it for the first time, as was the case on Sunday. Fortunately, we had a 2 and a half hour rehearsal to work on everything. By the end of the rehearsal, Stephen and I felt really good about all that we had accomplished. The orchestra rehearsed again last night. Today I drive to New Haven, this time with my wife Jeanne. We have the privilege of staying in the guest suite at Berkeley College, at t he invitation of the Berkeley Master, Marvin Chun. Then tomorrow, we will rehearse a little around 6 pm for the 8 pm concert. I'm very excited, thankfully not too nervous, that the concert is almost here. I've worked really hard on the piece this fall, and I am enjoying the results to this point. I look forward to sharing the piece with tomorrow night's fellow performers and the audience. Oh, here is the link to the BCO's website, if you would like to learn more about my concert and my son's orchestra. Above is a picture of my son Stephen. 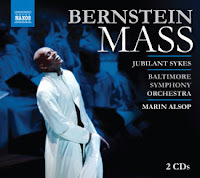 Got a tip-off about this from Tim Smith's noteworthy blog: the Baltimore Symphony Orchestra received a Grammy nomination for their recording of Bernstein's Mass yesterday in the Best Classical Album category. I suspected this recording would get this level of notoriety soon. Listen to clips or purchase the CD Here. And Marin Alsop got another Grammy nomination for the recording she did with the London Philharmonic with her pal (We can assume they are friends, right?- since Higdon's pieces and premieres are all over the BSO's lineup every year), Jennifer Higdon's piece, the Percussion Concerto. So, in other words, congrats to the musicians, Marin, and the staff who put this together! My son Stephen was home for Thanksgiving last week. He brought his orchestral score to the Sibelius Violin Concerto. He and I spent several hours studying it, mostly in the form of me playing the solo part as he followed the score, singing and conducting. We discussed how Stephen should conduct some parts where the meter of the piece is somewhat confusing, as the violas are in 4 while the rest of the orchestra is still in 6. We discussed tempos and how to make transitions. Not only was he learning how to conduct this particular concerto, and how I want to perform it; I too was learning again what it is to play a big romantic violin concerto with an orchestra (in this case the Berkeley College Orchestra of Yale University, an undergraduate group.) Despite the fact that the soloist gets most of the audience's attention in any concerto, there is a lot of give and take between soloist, conductor and orchestra. 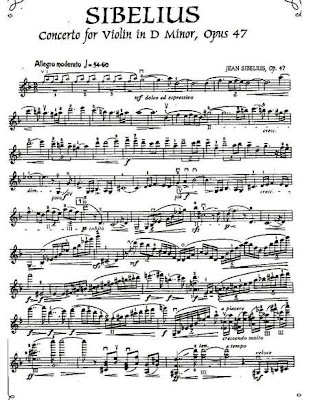 It is one thing for a soloist to know his notes, and quite another for him to understand where he must play as loudly as possible because the horns are playing at the same time, to know where there can be rhythmic freedom, and where he must play strictly in tempo to avoid causing the orchestra to have a train wreck! The last time I played a big solo concerto was 1993, so this is a reawakening of sorts for me. It truly is satisfying to practice one of the great masterpieces, to learn more and more about a piece that I have loved for decades. And the chance to perform it with my son conducting his orchestra makes it even more special than it would already be. I go up to New Haven this Sunday to rehearse with the orchestra, then the concert is the evening of December 11.